The economics profession has become a favourite punching bag in the aftermath of the global financial crisis. Economists are widely reviled and their influence derided by the general public. Yet their services have never been in greater demand. To unravel the paradox, we need to understand both the strengths and weaknesses of economics. Dani Rodrik argues that the multiplicity of theoretical frameworks - what economists call 'models' that exist side by side is economics' great strength. Economists are trained to hold diverse, possibly contradictory models of the world in their minds. This is what allows them, when they do their job right, to comprehend the world, make useful suggestions for improving it, and to advance their stock of knowledge over time. In short, it is what makes economics a 'science' a different kind ofscience from physics or some other natural sciences, but a science nonetheless. But syncretism is not a comfortable state of mind, and economists often jettison it for misplaced confidence and arrogance, especially when they confront questions of public policy. Economists are prone to fads and fashions, and behave too often as if their discipline is about the search for the model that works always and everywhere, rather than a portfolio of models. Their training lets them down when it comes to navigating among diverse models and figuring out which one applieswhere. Ideology and political preferences frequently substitute for analysis in choosing among models. 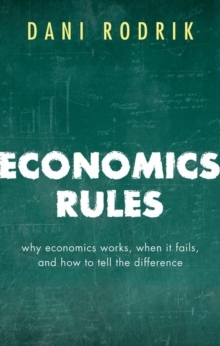 So the book offers both a defence and critique of economics. Economists' way of thinking about social phenomena has great advantages. But the flexible, contextual nature of economics is also its Achilles' heel in the hands of clumsy practitioners.